We have been living a nomadic lifestyle for well over 2 years now. We love it, the good and the bad (yes there is actually some bad) but probably what we love most is the freedom to change things when they are not working for us. The speed we travel is one of those things. When we started out our travel in Southeast Asia we were moving quite quickly around the area. 2 nights in one place, 1 week in another and constantly changing our minds and our plans. In the first year traveling we stayed in over 45 hotels. It was fabulous and exciting but as the second year started we lost a bit of steam and slowed down staying in one place for 2-3 months at a time. We are a family of 5 so making sure everyone needs are met can sometimes be a challenge, made more difficult with constant change. Most of us really enjoyed the slowed down pace, although admittedly I struggled a bit with feeling as though we weren't traveling enough. Being the kind of person that wants to see and do everything it is a personal challenge of mine that doesn't seem to get any easier no matter what our pace of travel is. But that is for different post I suppose. One year ago we decided to come to Hawaii in what was meant to be our longest stay yet; 6 whole months. It was amazing, so amazing that we decided to stay longer. It helped my wanderlust to move to a new island but it was still Hawaii. And this time we put down deeper roots, buying a car and furniture and signing a long term lease. So now we have been here over a year with plans to move to Mexico in a few short months. As we get ready to move on after being here for over 6 months I find myself feeling a little sad about leaving. Don't get me wrong I am still thrilled to move on but it has made me appreciate all the wonderful things about slowing down travel. No matter what you try to cram into a short 2-3 days there is no way you can get a real feel for local culture cuisine, and tradition. By staying put for a bit longer you end up discovering so much more about any given area. We found that while traveling at a fast pace it was difficult to engage locals and enjoy local experiences. We also missed out on numerous festivals and interesting events because we had not timed things right and didn't have the ability to stay put. Each of us has friends, lots of friends, but most of them are relationships we have forged online that have remained solely online. I do not discount the value in that. In this day and age those bonds are a real as the bonds we have with lifelong friends from home, but it is not quite the same as sitting down to a meal, playing soccer, or laying around on the beach with in person friends. The boys and I have all felt lacking in that type of interaction. We have met loads of other traveling families even when we were traveling fast but now that we have been in Hawaii for months we see the real benefits to parties, weekly get togethers, playing at the park with people you really enjoy, and being able to forge a deeper relationship through time. The faster you travel the quicker the money depletes, simple as that. No matter how frugal you are when you travel fast the money goes fast. With 5 people the actual travel component gets expensive very quickly. Taking buses, trains, and mini vans save us money over air travel but each time we do it is a big expense. We also have found that when you stay in one spot longer you can save a lot on accommodation. Committing to an apartment for 2 months is much cheaper than paying by the day or even the week. If you can push it to 6 months the rate lowers even further. Food, being our largest expense with 3 growing boys is also much cheaper when you can get an apartment. In most countries cooking for yourself, making your own coffee and breakfasts, and buying snacks in bulk saves loads over having to eat each and every meal at a restaurant. Although I sure do miss it some nights when dinner time rolls around and I am at a loss for something new to make. Lets face it, big attractions are big attractions for a reason and most of us want to see them. In a mad dash around the world though that is all you will have time to see. Between lines, distances between venues, and the thrown in tantrums or need for rest it can be a challenge to even get to the main events of any given city. When you slow down you have more opportunities to explore, get to know a town, camp out in a forest, and discover all the little hidden gems that, in our experience, oftentimes become the highlight of an area. Anyone who travels quickly can attest to the fact that it is anything BUT relaxing. When we were moving at a rapid pace not only were we exhausted from the day to day outings but the constant need to be researching the next destination felt constant. Over a years time that really took a lot of joy out of traveling. We needed off days, and the more time that went by it seemed the more off days we needed. Travel burnout is very real! Slowing down your travel can be the fix. We now have time to do nothing for days, chat with friends online, have a Harry Potter marathon, and rest. We did not even realize how much we needed that until we got it! Did I miss anything? How do you travel? 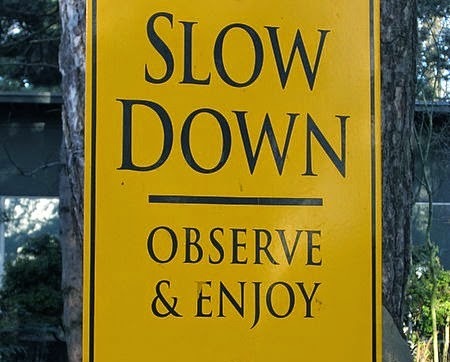 Slow or fast or have you found an in between balance of some kind?